Crest Cleaning Services provides Seattle industrial & commercial floor stripping. After several coats of floor wax have been laid down, the floor wax builds up. Built up wax on a floor can make the floor look dingy and dull, although wax can help preserve and shine the floor. It is necessary to preserve the life and the health of any floor to strip off these layers of wax. This completely prepares the floor for a new layer of wax that will make the floor look new again. Floors are a big deal in business lobbies, home bathrooms, condominium kitchens, and many other areas. They can be rather expensive to preserve an install. We specialize in stripping floors of old wax and stain removal. Our professional floor strippers prepare every floor for that new layer of wax that will make the customer very proud of the new looking floor. Crest Cleaning Services provides Seattle industrial & commercial floor stripping that will prepare the floor to look hard, shiny, and clean. These floors are usually one of the most impressive features of any building. Well maintained and attractive floors will provide a safe and clean working environment and enhance the professional image of any home or business. The first step to the process of having a better looking floor is stripping off the old wax. Our floor technicians have numerous years of experience and undergo a certification process after extensive training. They are professionals during every phase of the process including appearance, care of the premises, scheduling, communication as well as the end result. We will first vacuum the floors to remove debris, dust, and dirt. We will then deep clean the floors using a power floor scrubber to remove the remaining grime, debris, and dirt. If necessary, we will next use a hard surface steam cleaning tool up to 1000 psi, which removes ground in grime and dirt. Our floor technicians are especially careful to mask around carpeted areas and baseboards. Floors can become permanently damaged with unsafe and unsightly scratches as a result of ground in grit and dirt. Beautiful floor can become less than professional looking because high traffic areas will usually collect a considerable amount of grit and dirt. Our customers save money in the long run by having preventative maintenance and regular cleaning performed on their floors. This also increases the longevity of their floors. We can strip the floors in many different types of both large and small businesses, high school cafeterias, busy apartment building hallways, and gorgeous lobbies. We can do the same thing for homeowners. Our floor stripping rates are competitive and affordable. 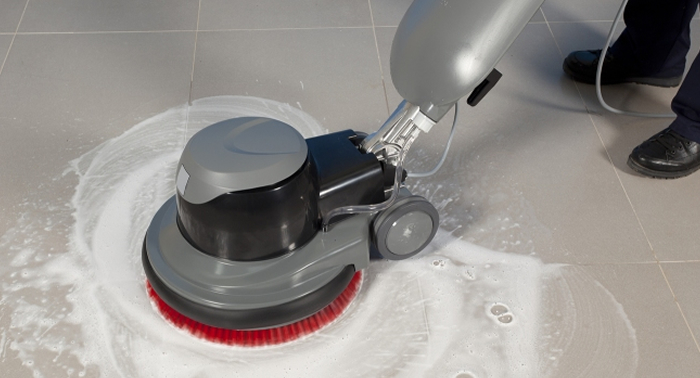 We provide superior floor care methods and cleaning techniques. We will do the job right the first time. Depending on the texture and kind of floor, we offer many different floor stripping techniques. Our floor technicians will pay close attention to hard to reach areas and corners. Crest Cleaning Services offers Seattle industrial & commercial floor stripping that is of the highest quality and our commercial floor cleaning services meet and exceeds our customer’s expectations. We take pride in satisfying our customers and enjoy what we do. Our business has an excellent track record, with considerable experience stripping floors in retail stores, offices, warehouses and homes. We can provide the highest quality floor stripping services for all kinds of floors such as no wax, marble, ceramic, cement, hardwood, and vinyl floors. Crest Cleaning Services provides Seattle industrial & commercial floor stripping that only uses environmentally friendly floor stripping solutions. Our number one objective is our customer’s satisfaction and we achieve that day after day. We have developed superior regimes and programs for floor stripping. We will deliver a cost effective floor stripping solution regardless of the size of the floor. Our customers are provided with a professional floor stripping service. Our floor technicians are professional, fully trained, dependable, reliable, and experienced people. That is the reason that they are some of the best in the floor stripping business. They will first analyze the condition of the floor to be stripped to determine the proper equipment and solution to strip the floor properly. We enjoy a sterling reputation from residential and commercial customers alike, throughout the Seattle area. We also guarantee that our customers will be 100% satisfied. In addition we will provide no obligation, free estimates at our customer’s convenience. Our customers’ floors are as important to them as they are to us. We will always go the extra mile to make sure that their floors are stripped properly. In addition to Crest Cleaning Services providing floor stripping in Seattle, WA, we also can provide waxing services to make our customer floors shine like they are new again. We also provide several different cleaning services such as tile, carpet, sofa, grout, upholstery, rug, and mattress cleaning as well as stain and spot removal, and pet odor and stain removal, and sanitizing and deodorizing. Our customers don’t have to look any further when they need a complete cleaning company.